A wonderful addition to any wedding or special event. 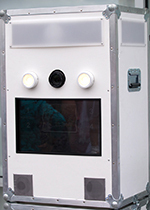 CINDERELLA PHOTO BOOTH is a sleek, clean and all white open air booth that will blend into any themed event or motif. Equipped with the latest digital technologies including a Canon DSLR Camera and 24″ flat panel touch screen monitor. The CINDERELLA BOOTH instantly emails the guest with digital images using the onsite WIFI (or our own for a small fee) with the optional Social Media Module to instantly upload to Instagram, Twitter, Facebook, etc. Great entertainment for Weddings, Corporate Events or Bar/Bat Mitzvahs. High-speed dye-sublimation for 2×6 photo strips or 4×6 prints. Prints in less than one minute.